At the time of this post, July 2018, this work can be seen in the Temples’ Valley in Agrigento, Italy. Agrigento is a wonderful city on the coast of Sicily, where many different ancient temples are still visible from the times of the Magna Grecia. The work is placed between the temples, in the context of a temporary exhibition held in Palermo and nearby for the summer 2018 (Palermo was nominated Italian Capital of Culture 2018): the exhibition, called Ecstasy & Oracles, was directed by Jan Fabre himself and counts more than 50 works by the artist. 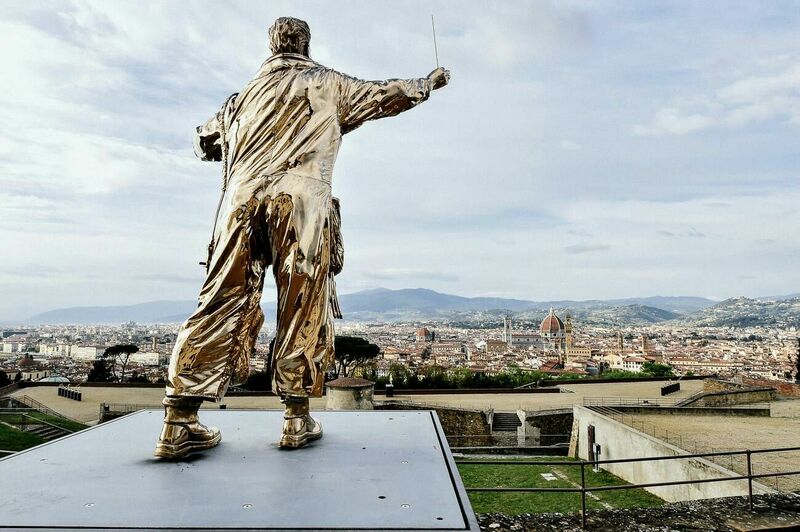 An image of The Man Who Directs The Stars, in Florence. In the Temples’ Valley in Agrigento there are two works: The Man Who Gives Fire (2002) and The Man Who Directs The Stars (2015), placed in dialogue with the ancient ruins. The two works are a clear reference to the always existent attempt of the human beings to control nature. The Ancient Greeks used to call it “hubris”, arrogance. When men happened to try be better than gods, or to challenge them, usually something terrible occurred to them and their families. Now those temples are just ruins, powerful memorabilia of what was and is not anymore. They were temples built to honour the gods, to pray them and to make sacrifices to them: now we are behaving like gods ourselves. With these two works Jan Fabre is referencing two ancient greek stories: Prometheus and Apollo. Prometheus was the god that betrayed Zeus to give the fire to the mankind. He had to suffer terrible pains as a punishment afterwards. Apollo was the god of the Sun, he was supervising his rising and his setting, making sure that everything was the same every day. Here these actions – that are so important for humans to live – are done by men, not gods. About The Man Who Gives Fire, a very harsh article was written: you can find it here. Although I personally like the sculpture, there are many different interpretations to give to it, and everyone is free to think what they want about it! This is the beauty of art. At the end, the era changed, the roles are inverted: we are gods, gods are object of tourism. Will we be punished for hubris?